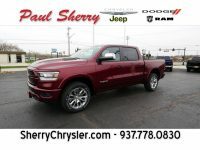 At Paul Sherry Chrysler Dodge Jeep RAM, we pride ourselves on offering a wide selection of vehicles for all purposes, including a variety of commercial trucks. Among the various commercial trucks that you will find in our inventory, there are RAM flatbed trucks. These are perfect for all your commercial needs in Ohio. All of the RAM flatbed trucks for sale in Ohio are built with the RAM Chassis, known for its durability and strength. The RAM Chassis also stands out with its best-in-class 10,000-mile oil change interval on the gas engine, saving time and money on maintenance. The commercial-grade V8 HEMI delivers best-in-class horsepower of 410 plus 429 pound-feet of torque. It also works with Fuel Saver Technology. Or the RAM Chassis can feature the class-exclusive 6.7-liter Cummins Turbo-Diesel with its best-in-class towing of 23,770 pounds and a 15,000-mile oil change interval. The RAM Chassis is known for its capability, with a maximum GCWR of as much as 38,500 pounds. It can also include capability-enhancing features like dual alternators for the best-in-class 440 amps with the diesel engine. In terms of durability, the RAM Chassis has been strictly tested by RAM to provide 200,000 customer-equivalent miles plus great long-lasting warranties. To supplement the RAM Chassis on our RAM flatbed trucks for sale at Sherry Chrysler, you will find Hillsboro aluminum flatbeds. Hillsboro has been in business for over half a century, building a reputation for producing rugged and capable gear. The Series 3000 and 4000 Aluminum Truck Beds are among the highest-quality truck beds you will find on the road today. They feature high-strength aluminum extruded floors and heavy-duty Tread Brite tailboards. Every element of these aluminum flatbeds is heavy-duty, from the extruded rub rails to the adjustable-height headache rack. These Hillsboro aluminum flatbeds also have convenient features built right in. These include LED lights and tapering with steps plus recessed aluminum castings ideal for the taillights. For added durability, the flatbeds are corrosion-resistant as well. They can also feature toolboxes and other useful accessories. 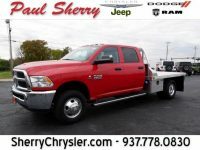 When it comes time to finding the right RAM flatbed truck for sale in Ohio, head to Paul Sherry Chrysler Dodge Jeep RAM. Our team is familiar with these vehicles and the various commercial uses that they can have. We can go over the various benefits and features of the RAM Chassis for you, as well as those of the Hillsboro aluminum flatbed. Our team will gladly answer any questions you have to ensure that you select the appropriate truck for your particular needs. After all, every situation and customer are different. When you choose to buy your RAM flatbed truck at our dealership, you can also take advantage of our on-site financing. We work with a range of large banks as well as local credit unions. This allows us to offer financing to our clients with ease, giving you the flexibility of getting your automotive loan from a dealership you trust. That way, you do not need to make multiple stops around the town. You can get a sneak peek at our selection of RAM flatbed trucks by browsing our inventory online. Feel free to send us a message via live chat or call us with any questions or doubts you have. Or, you can visit our dealership to see the in-stock options yourself. This will give you the benefit of having a one-on-one chat with one of our experts. 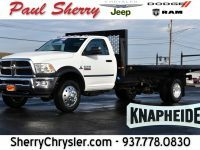 That way, you can discover RAM flatbed trucks that we may not have gotten a chance to list in our online inventory yet. Give us a call, talk to us online, or come visit our dealership to explore our RAM flatbed trucks and find one for your business.